For the last blog I talked about all the things I am thankful to enjoy in this life and on my list was my love of cooking and baking… I also promised you all a new wild game recipe. In the spirit of spring/summer I have been trying to eat more healthily and take advantage of some of the fresh vegetables that we have growing in our garden. 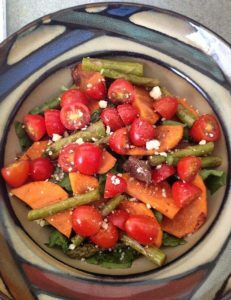 I have tried to take a salad to work most days and yes, I have heard many a co-worker and my husband say: “Salad…that’s what my food eats!” I figured that I would find a happy medium; eating healthy with a side of wild game! I have done this recipe with whitetail deer, mule deer and moose; feel free to substitute with whatever you have on hand. I’m going to test this out with duck and goose next season. The best part of this recipe is that it works really well as a ‘day after meal,’ as well if you have left over steak from a barbeque. You can just slice it up and use it in this recipe whether you warm it up or eat it cold. Maybe this is something to try out tonight for a Canada Day 150 celebration! *I have also used butter lettuce and iceberg lettuce; they both work. On a microwave-safe plate lay the slices of sweet potatoes down (don’t double layer! ); sprinkle them with the water. I cover them and microwave them on high for 2-3 minutes; they should be tender-crisp. –>If you prefer not to microwave; I have made this by simply lightly pan frying/roasting them and the asparagus with a little vegetable oil; if that is the case skip step #3. Rub the steak spice on your deer/moose steak. Cook your meat to your desired internal temperature. For medium-rare that is about 4 minutes per side on a medium-high heat. Let the meat rest for approximately 7-10 minutes; on a cutting board, covered in foil. Once rested, slice your steak; about 1/4 inch slices. –>My preference is to let my meat marinate always; so you could prep the night before if you want to really let the flavour penetrate the meat overnight. –>I have also seared the steak ove the stove and finished it in the oven during the winter, in case you are like me and can’t barbeque year-round. Reduce the barbeque heat to medium. Put your asparagus and sweet potatoes on and brush them with the 3 tbsp. of balsamic dressing; these will cook fast so pay attention, approximately 3-4 minutes. When they are browned and tender take them off the heat and allow them to cool. Once the asparagus is cool enough to handle cut it into 1 inch chunks. In a large bowl combine the sweet potatoes, asparagus, steak, lettuce, tomatoes and toss. Sprinkle with parmesan cheese.